No wonder Mick Jagger came on board as a producer to the James Brown biopic Get On Up. Fifty years ago, he and the Rolling Stones were the closing act, coming on after The Godfather of Soul and his Famous Flames’ 18-minute set at 1964’s T.A.M.I. Show. Brown’s performance is transcendent, otherworldly. Pity the fool that had to follow that. After 50 years, Jagger is still in awe and now he pays homage to the man with this kaleidoscopic drama. Anchored by 42 star Chadwick Boseman’s incandescent performance in the central role and directed by Tate Taylor (The Help), Get On Up is a magnificent mess, overlong and its various parts never quite gelling. But whenever Boseman steps on stage (which is often), like Brown at that long ago T.A.M.I. Show, the film is electrifying. The approach that screenwriters Jez and John-Henry Butterworth take to Brown is nonlinear. They begin with a particularly low point in his life with his glory days seemingly behind him before heading backward, weaving back and forth in time. Here he is a little boy (Jamarion and Jordan Scott), caught between an indifferent mother (Viola Davis) and an abusive father (Lennie James), and eventually abandoned to live in a brothel with his Aunt Honey (Octavia Spencer). There he is a young adult honing his act with the Flames. There is again and now he’s a superstar. 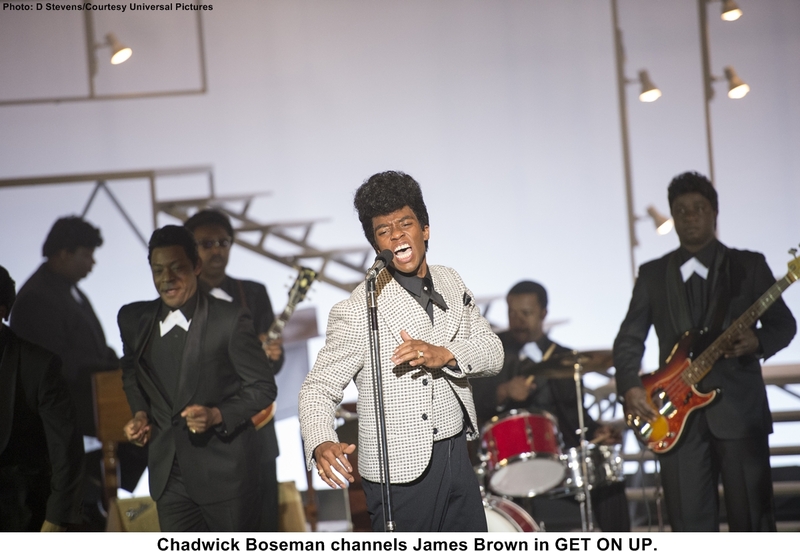 In some ways, Get On Up takes a greatest hits approach to Brown’s life, as the film tries to cram in all of the highlights: the beginning of his collaboration and friendship with singer and musician Bobby Byrd (Nelsan Ellis), the most sustained relationship of his life; a meeting with Little Richard (Brandon Smith in a scene-stealing cameo) that changes the course of his career; his first meeting with agent Ben Bart (Dan Akroyd); the T.A.M.I. Show; the Apollo; Ski Party; 1968 Boston Garden, in the wake of Martin Luther King Jr.’s assassination; Paris 1971, etc. All of Brown’s funk and soul classics are represented as well: “Please, Please, Please,” “I Got You,” “It’s a Man’s Man’s Man’s World,” “Papa’s Got a Brand New Bag,” and so much more. At the same time, the drama contrasts Brown’s dazzling onstage persona with the fractious personality offstage. He could be petty, abusive to his wives and disrespectful to his bands. There is too much of the offstage melodrama, which becomes repetitive after a while. Like a lot of great artists, James Brown wasn’t necessarily a great guy. Establish that and move on. And moments where Boseman breaks the fourth wall to address the audience directly just don’t work. Spaced at odd intervals, those scenes don’t just break that fourth wall, they break the movie’s spell. The offstage scenes that work best are those with Little Richard, one of the few scenes where Brown is not fully in charge, and with Byrd and Bart, the two people who seem to most fully see past the bluff and into Brown’s heart.